What's Happy Isles? It's a pair of islands in the Merced River at the east end of Yosemite Valley near the Mist Trail trailhead. Word is they're happy. Why hike the Happy Isles trail? If your own personal happy place is the bar at the Ahwahnee Hotel but your conscience compels you to complete at least one hike before you go, Happy Isles will be one of the most efficient ways to dispense with that requirement. It's also pretty, though not especially memorable by Yosemite standards. 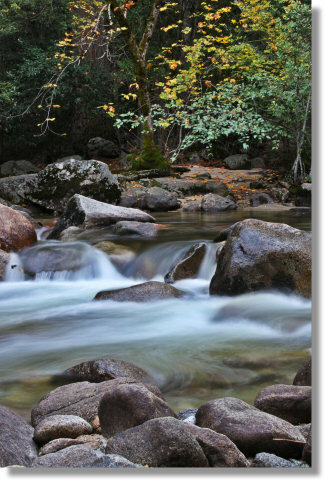 Best Time to Visit: In the late summer and fall, when the lower water levels provide a more tranquil atmosphere. If you want to get into the Art & Nature Center, you'll have to show up sometime from April through October. Crowd Factor: Usually not oppressive - the scenery doesn't merit big crowds - but steady. Skinnydipping will not go unobserved. Lack of Difficulty: Nearly absolute. If your friends stop to use the bathroom at the trailhead, you can knock off the entire trail before they finish. Maybe twice, depending on how much of a hurry each of you are respectively in. Wheelchair Friendly? Much of the trail is paved, although the bits across the river on the actual Happy Isles are not. Nearest Bathrooms: Bathrooms with plumbing at the start of the hike. Nearest Snacks: At Curry Village (currently calling itself Half Dome Village), 3/4 of a mile west. Trail Notes: The Art & Nature Center (see the trail map) houses a collection of kid-oriented natural history exhibits and the Yosemite Conservancy's art program, which offers art classes when the center's open (April through October). The Rockfall Exhibit (again, see the trail map) is a series of placards discussing rocks and their distressing tendency to fall in great masses in the Happy Isles area. See this Google Street View panorama for a southish-facing view of the trailhead. Visible here, from right to left, are the shuttle bus stop (stop 16 on the shuttle map), bathrooms, and the now-closed snack shop, plus a trail sign that you can inspect more closely on the trail map page.